US President Trump said in an interview published Sunday that both Israelis and Palestinians are playing roles in hindering peace in the region. “Right now, I would say the Palestinians are not looking to make peace, they are not looking to make peace. And I am not necessarily sure that Israel is looking to make peace. So we are just going to have to see what happens,” Trump told Israel Hayom. 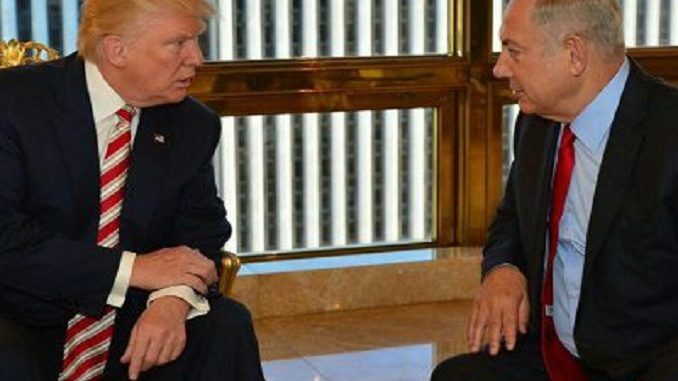 Trump went on to say that controversial Israeli land settlements have played a role in muddling the peace process. “We will be talking about settlements. The settlements are something that very much complicates and always have complicated making peace, so I think Israel has to be very careful with the settlements,” he told Israel Hayom. Trump threatened to cut additional aid to Palestinians last month after the U.S. announced it was withholding $65 million in aid to the United Nations agency that serves Palestinian refugees. “That money is on the table and that money is not going to them unless they sit down and negotiate peace,” Trump said last month beside Israeli Prime Minister Benjamin Netanyahu at the World Economic Forum in Davos, Switzerland. Trump drew the ire of Palestinians and the international community in December when he announced the U.S. would recognize Jerusalem as the Israeli capital in violation of international law. Palestinians view East Jerusalem as the capital of a future Palestinian state, a position that is consistent with the legal and political views of the rest of the world.